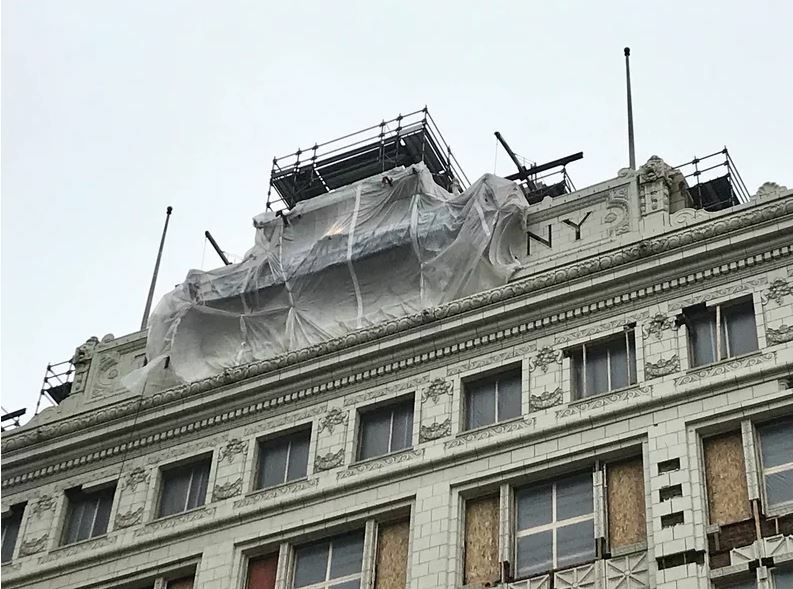 Along with snowflakes, icicles and snowplows, huge plastic sheets forming enclosures attached to buildings under construction or undergoing restoration are becoming another sign of winter in Northeast Ohio. The plastic shrouds on platforms with enough room for two to eight construction workers to labor inside them are typically called tents in the trade. Northeast Ohio building contractors use them in part to lengthen the construction season — sometimes referred to as the offseason for the business — but also to respond to evolving material technologies and even real estate market trends. While Higley primarily uses tenting over the installation of masonry, Vaughan said it’s a tough call when to use it, as the productivity is not as good as in the normal building season. “You’re fixing the tent constantly,” he said. While one wall of the apartments at The Wolstein Group’s Flats at East Bank project in Cleveland was covered by plastic sheets in late spring 2015, the tents put in place are typically smaller than further north, where an entire building may be covered the way a dome covers Krenzler Field in the winter months at Cleveland State University. However, there have been some big tents in the past. For example, Welty Building Co. put all the suites on the end zones of the Tom Benson Hall of Fame Stadium in Canton inside a tent to get that project ready for its 2017 debut. The 18-month construction period for the American Greetings Worlds Studios in Westlake required tenting over the construction site for the 880,000-square-foot property, which opened in 2016. Burns, with decades of construction experience, including a stint in Norway, said contractors 20 years ago might have done a roof in a snowstorm. But no more. That also allows manufacturers’ warranties to be kept in place, Burns added. Even inside new apartment buildings, he noted, popular luxury vinyl tile products require low humidity and temperatures in the 70-degree range. Jim Nystrand, Cleveland regional manager for Livonia, Mich.-based RAM Construction Services, said some sealants used in brick joint can push the envelope to as low as 25 degrees, while in the past 40 degrees was typical. “That lends contractors like us the ability to work in colder environments,” Nystrand said. Constantly changing weather conditions mean work still needs to be adapted to conditions. Tenting also helps in situations where the walls need to be heated to install wall sealants. Nystrand said RAM is increasingly using mast climbers in winter months. With supports that cover the side of a building, the company builds tents around work platforms that can also connect tightly to the structure and be heated as crews work their way up. RAM has two such mast climbers in place on the exterior of the long-empty John Hartness Brown building complex at 1001 Euclid Ave. where it’s repairing the terra cotta as part of a project to add 200-plus apartments to the old office buildings. 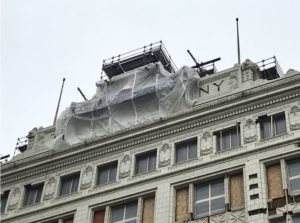 It also has put mast climbers reaching across two sides of the Verizon Building, 1150 W. Third St., that crews will use to repair the six-story building’s facade. “The enclosures allow crews to have more palatable working conditions in freezing weather as they repair concrete or mortar joints,” Nystrand said. Mast climbers are also more efficient. The alternative is a swing stage that can be used by just two workers, while enclosed platforms on mast climbers can accommodate as many as eight. Current economic and real estate market conditions are also a factor in the increased use of tent enclosures on construction sites. Burns said real estate developers using Ohio State Historic Preservation Tax Credits and multiple sources of capital often have tighter deadlines than those using conventional financing methods of the past. Another factor cited by multiple observers is that real estate developers are pushing to get their projects finished before their competitors do. That way, they can market and lease apartments before their competitors’ jobs are done — a big factor when developers are testing the appetite of downtown Cleveland and Northeast Ohio for more apartments. Nystrand and others said the busy commercial, industrial and institutional markets are also creating more projects than Northeast Ohioans typically see — and more winter work as a result.